Astronomers have captured a striking view of the galaxy NGC 3981, which is revealed shining with the light of energetic stars, surrounded by its ghostly spiral arms. Located roughly 65 million light-years from Earth, it appears to have been disrupted by a close call with a neighboring galaxy. NGC 3981 shares a number of characteristics our home galaxy, the Milky Way. Both play host to sweeping spiral arms, and at the heart of each cosmic leviathan lurks a supermassive black hole. These insatiable monsters can be truly massive – the supermassive black hole residing in the center of our galaxy, Sagittarius A*, is thought to have a mass the equivalent to over four million Suns. Astronomers have witnessed spiral galaxies interacting before, and such titanic sparring matches often leave the contenders deformed. The Milky Way is thought to have consumed many smaller galaxies, and in around four billion years, will itself fall victim to the Andromeda galaxy’s gravitational influence. 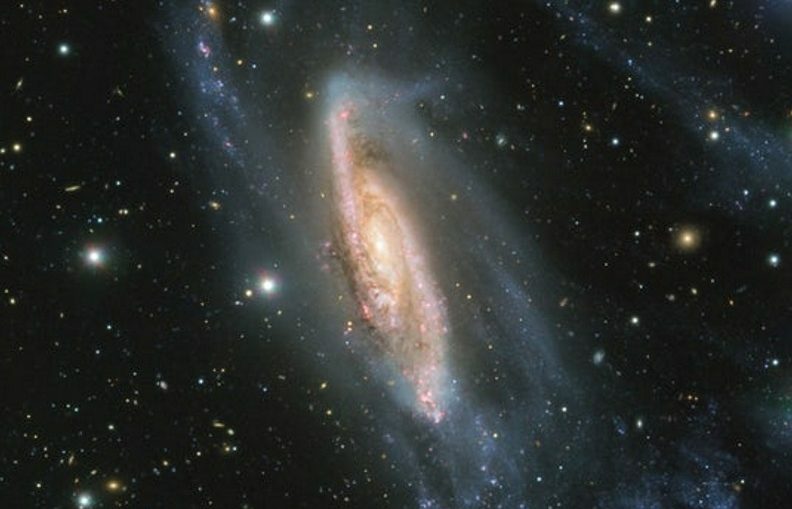 Researchers behind the new observations believe that the distorting effects of a galactic encounter are also visible in NGC 3981. The wispy outer spiral arms extending from the bright center of the object appear stretched, possibly by the gravitational influence of a large neighboring galaxy. NGC 3981 is also part of the Milky Way’s (very) extended galactic neighborhood, known as the Virgo Supercluster. This vast network of several thousand galaxies encompasses both the Local Cluster, home to the Milky Way, and the NGC 4038 group, in which the recently imaged galaxy resides. This latest picture of our distant neighbor was captured using the European Southern Observatory’s (ESO) Focal Reducer and low dispersion Spectropgraph 2 (FORS2) instrument, mounted on Unit Telescope 1 of the Very Large Telescope, at the Paranal Observatory, Chile. FORS2 is an impressively versatile scientific instrument, sometimes described as a “Swiss Army Knife” owing to its ability to fulfill a wide range of roles. The new portrait of NGC 3981 was captured as part of the ESO’s Cosmic Gems Program, which seeks to educate and engage the public with awe-inspiring images of the cosmos. Telescope time on powerful observatories such as the VLT is a limited and highly contested resource. Therefore, public outreach campaigns are given a low priority compared to targeted scientific observations and surveys. Astronomers are only given permission to capture images for programs like Cosmic Gems when the conditions for observing the heavens are relatively poor. For example, on moonlit nights, or on rare occasions when clouds partially obscures the usually pristine skies above the Paranal Observatory. Programs such as Cosmic Gems ensure that telescopes are always being put to good use, no matter the conditions. In the new image, NGC 3981’s pronounced central disk can be seen shining with the light of hot, young stars. However, as is so often the case with astrophotography, not all is as it seems. Elements of the striking galactic vista are much closer to home than they appear. A number of bright foreground stars peppering the image actually belong to our own Milky Way, and to the top of the image, a roaming comet can be seen photobombing the dramatic scene. The mosaic of NGC 3981 was made from data collected over the course of three exposures. If you look closely at the comet’s path across the sky, you can see that its color shifts from blue, to green, to red, denoting the separate exposures that make up the image. The video below zooms in on NGC 3981 from the perspective of Earth.